There is no command of Christ so explicit as the one that we as his disciples are each to take up our cross and follow him. Jesus said that we are to do this day after day. Altarwalk is a spiritual formation exercise that encourages understanding and participating in this first call of discipleship on our lives. It was created for and first displayed at the 2004 National Conference of the Christian Dance Fellowship of Canada. Since then, Altarwalk has been installed at Anglican, Baptist and Lutheran churches, the Anglican Cathedral for the Diocese of Edmonton and at Prairie Bible Institute in Three Hills Alberta. The Altarwalk exercise consists of nine devotional stations. The first of the stations serves to introduce the work. The other eight consider aspects or elements of Christ’s cross experience, and generally encourage both emulation and appreciation of Christ relative to each element. The themes explored are suffering, rejection, dependence, trust, integrity, courage, self-relinquishment and redemptive acts. 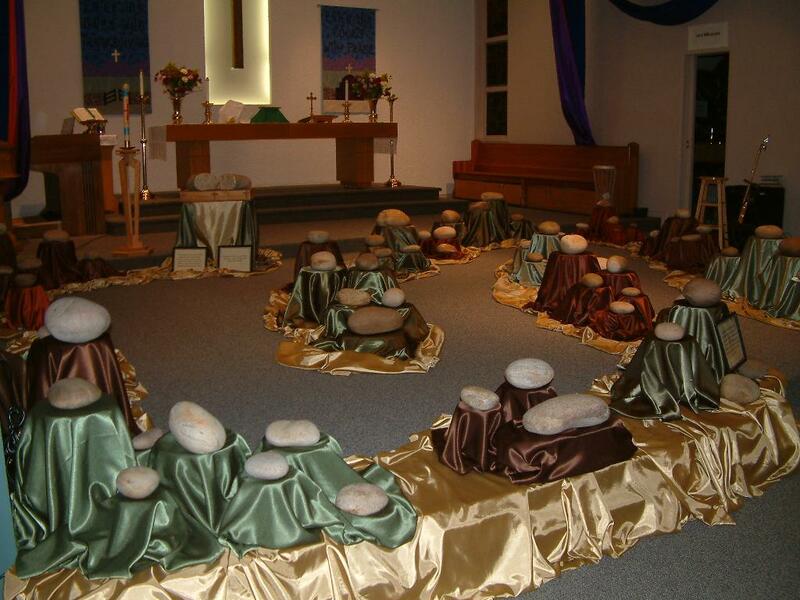 The exploration is through the reflective readings in a booklet, a metaphorical illustration of each theme through rocks and fabric, and through prayer bowls that use imagery combined with scriptural references that encourage engaging in prayer as a process for shaping the person. The aesthetic of the work is enhanced by the placement of more than one hundred candles. The Altarwalk process reflects some aspects of the ancient Christian devotional exercises of pilgrimage, labyrinth, Stations of the Cross and Veneration of the Cross, but is a unique and distinct exercise. It is similar to Stations of the Cross insofar as there are devotional stations for prayer and meditation. Like a pilgrimage, it is metaphorical of a spiritual journey, and it is similar to a labyrinth insofar as each encourages the inward and outward journey. As in a Veneration of the Cross service, the Cross is central to Altarwalk. To understand Altarwalk in its own right, it is best to describe it as a liturgical sculpture. The nine prayer stations and connecting fabrics make a work that is between thirty-five and sixty-five meters long (one to two hundred feet) to create the metaphorical journey. The twenty-one rocks range in size up to two hundred and thirty kilograms (five hundred pounds), and have been selected to act as metaphors for the devotional writings. For example, participants are encouraged to seek Christ’s heart of courage through glacially gouged rocks that symbolize the scourging. Fabrics are similarly selected for patterns and colours that enhance the illustration of each theme, as are the candleholders and prayer bowls. The net effect of the whole arrangement creates a sculpture that serves as a room sized schematic illustration of a theological interpretation of “what it means to take up one’s cross and follow Jesus” (see last page). Through the writings and stations, people are encouraged to engage all aspects of their humanness in the exercise. Liturgy is fairly described as “the work of the people”. As one walks from station to station, and engages interactively with the sculpture in a “whole person worship experience”, the exercise indeed can become the work of the people. Altarwalk can be used a variety of ways. It can serve as a self-guided personal exercise, suitable for either individuals or small groups of up to ten. Done in its entirety in this manner, the walk can take 60 to 120 minutes to complete, depending upon how long a person meditates and prays at the stations. Some people choose to do Altarwalk even more slowly, doing one to three stations a day over a number of days. Alternatively, the devotion can also serve as a spiritual backdrop for groups engaging in a vision quest. It has also been used as the thematic background setting for emergent style church services, such as have been done at St. Paul’s Anglican, Edmonton during the season of Lent, at a 2006 Good Friday Eucharistic service that was co-hosted by Edmonton’s City Centre Pentecostal and St. Paul’s Anglican congregations, and at a special Epiphany service co-hosted by St. Paul’s and Urban Bridge Church (P.O.A.C.). A second Altarwalk exercise is now being developed exploring the Incarnation and incarnational living. The Bread of Life station from that series is in the photo link below. For more photos and descriptions, see the Throne Room page of this site. This entry was posted on September 18, 2006 at 4:57 am and is filed under Uncategorized. You can subscribe via RSS 2.0 feed to this post's comments. You can comment below, or link to this permanent URL from your own site. Is this the same presentation which would have been at St Paul’s Anglican earlier this year? If it is, I believe my wife highly recommends it.